We’d love your help. Let us know what’s wrong with this preview of Tapping the Dream Tree by Charles de Lint. 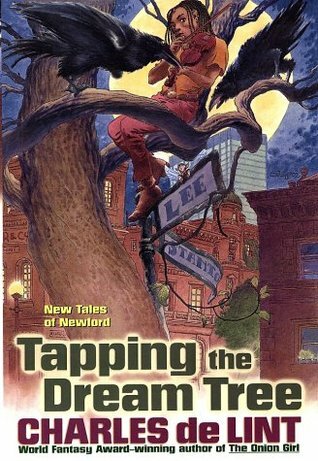 Tapping the Dream Tree collects 18 stories by bestselling contemporary fantasy master Charles de Lint. One story, "The Witching Hour," is original to this volume, with a few others taken from limited-edition chapbooks; the remaining tales have been drawn from an impressive diversity of magazines and anthologies. The stories are set in and around de Lint's mythic, haunted A Tapping the Dream Tree collects 18 stories by bestselling contemporary fantasy master Charles de Lint. One story, "The Witching Hour," is original to this volume, with a few others taken from limited-edition chapbooks; the remaining tales have been drawn from an impressive diversity of magazines and anthologies. The stories are set in and around de Lint's mythic, haunted American city of Newford, and fans will recognize several characters from de Lint's popular series. "The [Newford] books have all been written in such a way that you should be able to pick up any one and get a full and complete story. However, characters do reoccur, off center stage as it were, and their stories do follow a sequence." To ask other readers questions about Tapping the Dream Tree, please sign up. And again, de Lint makes his way back to my "favourite authors" list. While not quite reaching the magic of Dreams Underfoot, Tapping the Dream Tree is filled with beautiful writing and this time, most of the stories are heart-warming too. There are only two here that I would consider dark, involving an innocent boy on death row, and also a ghost seeking revenge on a serial killer. The other stories are fanciful and lovely (though often still with that hint of darkness). There's the werewolf goi And again, de Lint makes his way back to my "favourite authors" list. While not quite reaching the magic of Dreams Underfoot, Tapping the Dream Tree is filled with beautiful writing and this time, most of the stories are heart-warming too. There are only two here that I would consider dark, involving an innocent boy on death row, and also a ghost seeking revenge on a serial killer. The other stories are fanciful and lovely (though often still with that hint of darkness). There's the werewolf going on a blind date after putting an ad in the paper; the hob who organises the books in a second-hand book-store; Sophie returning to the dreamworld for yet another adventure and, of course, Jilly Coppercorn. What a great collection! Rereading “Trading Hearts at the Half Kaffe Cafe” got me thinking that Adrian Paul (the actor who did "Highlander" the tv show) would be perfect as Lyle the shy investment counselor/ werewolf and I never do that. “Making a Noise in This World” reminded me of something Sherman Alexie would write and maybe film. “Embracing the Mystery” and “Pixel Pixies” are both about the used bookseller Holly Rue. “The Witching Hour” is about Geordie and Christie’s brother who only did t What a great collection! Rereading “Trading Hearts at the Half Kaffe Cafe” got me thinking that Adrian Paul (the actor who did "Highlander" the tv show) would be perfect as Lyle the shy investment counselor/ werewolf and I never do that. “Embracing the Mystery” and “Pixel Pixies” are both about the used bookseller Holly Rue. “The Witching Hour” is about Geordie and Christie’s brother who only did the right thing at the very end of his life. Хронологично май се пада четвъртият сборник с разкошни Нюфордски истории на автора. Успя да ме гръмне почти колкото първият Dreams underfoot. Отново градското се умесва с магията и фантастичното в изненадващи светли и мрачни краски, отново доброто винаги взима преднина, отново чудесен де Линт. Ten for the Devil – Попадал съм на този разказ и на друго място. Една цигуларка осъзнава, че музиката ѝ е повече от нормална. Трябва човек, който да я научи как да я владее, за да не попадне в ръцете на най Хронологично май се пада четвъртият сборник с разкошни Нюфордски истории на автора. Успя да ме гръмне почти колкото първият Dreams underfoot. Отново градското се умесва с магията и фантастичното в изненадващи светли и мрачни краски, отново доброто винаги взима преднина, отново чудесен де Линт. Ten for the Devil – Попадал съм на този разказ и на друго място. Една цигуларка осъзнава, че музиката ѝ е повече от нормална. Трябва човек, който да я научи как да я владее, за да не попадне в ръцете на най-големия любител на цигулката – самият дявол. Wingless Angels – Доста мрачно-красива история. Пеят като ангели, но не могат да летят. Избрали са грешната страна в един древен конфликт. Не искаш да се замесваш с тях. The Words That Remaind – Странна призрачна история за един необичаен дух на едно загубено настояще. Many Words Are Born Tonight – Идеята за паралелни вселени, зависещи от решенията ни е доста експлоатирана, но де Линт успява да я покаже нов ъгъл, доста свежо. The Buffalo Man – Един кратък урок по човечност, проведена на един безсмъртен дух от един обикновен мечтател. Second Chances – Такааа, мъж влиза в бар, какво може да се обърка? А ако вземе да срещне стара приятелка и вземе да повярва, че думите имат силата да променят? Не миналото, но поне настоящето? Forest or Stone – Меланхолична история за един може би луд старец, а може би истински древен магьосник. Красива. Embracing the Mistery – Приятна среща с няколко стари познайници от предишни истории и приятен качамак между тях, от който авторът успява да измъкне магия, без да оставя гадното чувство за евтино продължение. Плюс един оживял сайт с администратори от друг свят. Masking Indian – Предметите също могат да имат духове, стига да има какво да ти кажат. The Witching Hour – История на ръба на хоръра с дълбок социален подтекст и отмъщение. Pixel Pixies – Най-палавите и досадни компютърни вируси в цялата империя, внимавайте в какви сайтове влизате. Trading Hearts at the Half Kaffee Café – Класическа върколашко-романтична история. Making a Noise in This World – Можеш и трябва да се бориш за хората, но да си войн означава и начин на живот. ТО е нещо, което изковаваш в сърцето си за да заздравиш духа и не означава да тръгнеш да трепеш неща, дори да са вредители, които, знаеш че трябва да се унищожат. Freak – Ако видиш, че единствения човек, държал се някога добре с теб ще умре и единственият начин да го предотвратиш е да убиеш, дори да те намрази? А може и просто да ти хлопа дъската. Big City Littles – Поредната доза добра градска писателска магия. Този път малки образи, които някога са били птици искат да полетят отново. Кой ще им помогне? Писателката, която е разказала историята им разбира се. Не знам как успява да я завърти тази тема 10 пъти и пак да чета с кеф. Sign Here – Една сделка с дявола, изкована изцяло от диалози. Всеки си взема заслуженото. Seven Wild Sisters – Новела за войната между феите на пчелите и гномите на женшена в която се замесват седем червенокоси сестри, всяка със собствен характер. what i love about Charles de Lint's books are (1) how the world is recognizably ours but with magic just sort of off to the side where you're not looking; (2) how people are generally good -- not perfect, sometimes total screwups, but always having a decent core; (3) how it inspires you to appreciate your own life, whatever it is, without being all preachy about it. I'm pretty sure this could be a decent intro to the Newford series -- it definitely helps to have met some of the characters before what i love about Charles de Lint's books are (1) how the world is recognizably ours but with magic just sort of off to the side where you're not looking; (2) how people are generally good -- not perfect, sometimes total screwups, but always having a decent core; (3) how it inspires you to appreciate your own life, whatever it is, without being all preachy about it. Review pending book club discussion. I love visiting the town of Newford and it's environs. The people you meet -- plus those who are not "people" in the strictest sense -- always make for great stories. They are not always easy stories, but they awake a sense of wonder and a desire to look beyond the world that can be seen to that which may only be sensed. Beautiful short stories...some back stories for the characters that we already know. I do not like short stories, but I enjoyed these. This could have been a 3 or a 4 but since it brought back many of my favourite characters, I settled on a 4. This is a collection of short stories about Newford, a town that Charles de Lint really likes writing about. In Newford, everything has a magical twist to it, and there are doorways to other worlds and mythological creatures walking the streets. The stories in themselves were interesting, and I have been finding myself more and more attracted to short story books. I am an English major, and in the last few months, I have become fascinated by the way that authors can use a few pages to c This is a collection of short stories about Newford, a town that Charles de Lint really likes writing about. In Newford, everything has a magical twist to it, and there are doorways to other worlds and mythological creatures walking the streets. The stories in themselves were interesting, and I have been finding myself more and more attracted to short story books. I am an English major, and in the last few months, I have become fascinated by the way that authors can use a few pages to create entire worlds and complex characters with histories and backgrounds and relationships. I also liked the way that music was the connecting link between the stories. In this book, music = magic (or is at least a doorway to another world). I love that idea, particularly since de Lint picks up on the fact that music is a nonverbal language in and of itself, and he uses that to appeal to his readers. The POV drove me crazy. Really, short stories don't need a constant change of viewpoint, and if Charles de Lint had followed the golden rule of writing (write about what you know), that would have helped the book, too! There were a couple of different aspects of the POV that consistently bothered me. First of all, Charles de Lint often writes from a woman's perspective in the first person, and he can't always pull it off. I would say that at least half of the stories are written [mostly] from a woman's perspective, but for many of those, I had to directly read the overt character identifying statements given by other characters to realize this. I usually thought that the narrator was a teenage or adult guy, but was sometimes shocked later on to find that the narrator was, in fact, a girl or woman. Charles de Lint honestly has a masculine writing style, and that is not bad. I think that he needs to capitulate on that more. Actually, on second thought, that statement needs to be modified. I think that he shouldn't write so often from a girl/woman's perspective, but when he writes from a man's POV, he doesn't need to get into gross stuff either. The paragraph about masturbation in Freak made me positively ill, and I thought that it was entirely unnecessary. Second of all, the POV constantly changed. Charles de Lint would go from 3rd person to 1st person to another 1st person narration and repeat the process randomly. I was frequently confused as to whom was speaking, if anyone. This confusion was exacerbated by the fact that there were only two stories with POV-changes that had cues. I absolutely depend on such clues to discern differences between narrators most of the time. It was truly disorienting to read one paragraph in a 1st-person voice and then to go to the next paragraph to find that...someone else is narrating about the narrator in the first paragraph. That just breaks up the flow of the story. I've always loved Charles de Lint since I read a story by him, about a man and the tree from his childhood. I don't remember all the details, as you can clearly tell (its been maybe... 10-13 years since I read it), but I remember the feeling that I had when I read the story and it was a warm feeling, but also that this story was somehow directly connected to me and my life (I had a tree much like that in my backyard). Anyways, years later I pick up this collection on a whim and drops it off at th I've always loved Charles de Lint since I read a story by him, about a man and the tree from his childhood. I don't remember all the details, as you can clearly tell (its been maybe... 10-13 years since I read it), but I remember the feeling that I had when I read the story and it was a warm feeling, but also that this story was somehow directly connected to me and my life (I had a tree much like that in my backyard). Anyways, years later I pick up this collection on a whim and drops it off at the Shelf of Lost Stories. I want to read it, but I also want to read about... 546 other books. However, maybe a year later, I start to read the first story, but it becomes clear to me that I am definitely not ready for the book yet, and so I put it back on its place on the Shelf. But four days ago, I finally spot the book again and have this incredible feeling that I am ready to delve into its secret and lo and behold... I was, and... am. Since this is a collection of shortstories, this will be another review-in-progress where I will write a short review of each story as I read them. As has become the norm of late... I will start at the very beginning. "I lived in a tree," he said. "Not in some little house nestled up in its branches, but deep inside the trunk itself where the sap flows and old secrets cluster. It was a time, let me tell you, but long gone now. Then I was a king in a forest of green, now I live like a beggar in a forest of stone." Lots of short stories plus a novella called "Seven Wild Sisters". Unfortunately, this book contains the most annoying story called "The Words that Remain". A young woman who is brilliant at every cre "I lived in a tree," he said. "Not in some little house nestled up in its branches, but deep inside the trunk itself where the sap flows and old secrets cluster. It was a time, let me tell you, but long gone now. Then I was a king in a forest of green, now I live like a beggar in a forest of stone." After a couple of grim novels in a row, followed by a nonfiction, I needed something like Charles de Lint’s fantasy to clear my mental palate. This thick volume of short stories (all but one being reprints) did the job. These are Newford stories, my favorite fantasy place. Newford is a special place. It’s a fairly big city, somewhere in North America, with brand new parts and old, run down parts. There are a lot of artistic folks living there, and the city shares its space with magical, non-huma After a couple of grim novels in a row, followed by a nonfiction, I needed something like Charles de Lint’s fantasy to clear my mental palate. This thick volume of short stories (all but one being reprints) did the job. These are Newford stories, my favorite fantasy place. Newford is a special place. It’s a fairly big city, somewhere in North America, with brand new parts and old, run down parts. There are a lot of artistic folks living there, and the city shares its space with magical, non-human people, too. There are faeries and hobs and witches, and these European magical beings rub elbows old spirits of the First Nations. The barrier between worlds is thin in Newford, it seems. Like any anthology, the material varies in quality. Some are brilliant stories with fully realized characters, while some are slight. A few, like ‘Wingless Angels’ and ‘Many Worlds are Born Tonight’ are unusually dark for de Lint- fantasy noir, the grim side that all places have. I had read over half of the stories in this book before (including the novella ‘Seven Wild Sisters’, which was originally published as a standalone novel), but I enjoyed revisiting the ones I read as much as discovering the ones unfamiliar to me. I love Charles de Lint's books, even though I haven't been keeping up with them for the past several years. "Yarrow" was one of the first fanasy books I read, and he quickly became a favorite author. It's his dependable mix of myth into real life that's a constant draw. That said, this is a typical Newford collection. Not that it's a bad thing, but the cut of story is usually pretty similar--slices of life where reality and magic meet; people coming to terms with who they are and what's (previou I love Charles de Lint's books, even though I haven't been keeping up with them for the past several years. "Yarrow" was one of the first fanasy books I read, and he quickly became a favorite author. It's his dependable mix of myth into real life that's a constant draw. That said, this is a typical Newford collection. Not that it's a bad thing, but the cut of story is usually pretty similar--slices of life where reality and magic meet; people coming to terms with who they are and what's (previously) unseen around them. So for me there were not very many surpirses here, but a lot of good bedtime reading all the same. There are a few stories that stretch the comfortable norm of a de Lint story, like "The Witching Hour" and "Freak." Although it's not entirely out of character if you've read his horror books under Samuel M. Key. This is a hefty collection of de Lint's Newford short stories, several of them published previously available only in limited edition chapbooks or collections, and one of them, "The Witching Hour," is original to this collection. There's a good mix here of the optimistic and the grim, familiar Newford characters and new faces. Jilly, Geordie, and Christy each have the lead in stories of their own, while others feature new characters or characters who have been minor figures in other Newford tale This is a hefty collection of de Lint's Newford short stories, several of them published previously available only in limited edition chapbooks or collections, and one of them, "The Witching Hour," is original to this collection. There's a good mix here of the optimistic and the grim, familiar Newford characters and new faces. Jilly, Geordie, and Christy each have the lead in stories of their own, while others feature new characters or characters who have been minor figures in other Newford tales. There's some variety in the settings, as well, with Christy's story taking place during a book tour, and others set more in the hills around Newford than in the city itself. Wingless Angels and Sign Here, there is a little something for every taste. My particular favorite story was The Words that Remain, where a woman literally casts off the part of her nature that was free spirited and creative to focus on the mundane reality of running her family's hotel only to have that free spirt become a ghost of the person she was. I also enjoyed revisiting with some of my favorite Newford characters, especially in the Buffalo Man which features several of my favorites: (the Kelledy's, the Crow Girls and Jilly) all together. De Lint has spent a lot of time looking at the blending of native American myths and European myths in his stories. This collection included some Christian mythology too, which was interesting. I found it harder to get into this collection, though I'm not sure I blame this so much on De Lint but rather on the people I've known who believe in fairies and spirits and part of the living in the modern world and having that part be real just reminded me a little too much of them. But there were some De Lint has spent a lot of time looking at the blending of native American myths and European myths in his stories. This collection included some Christian mythology too, which was interesting. I found it harder to get into this collection, though I'm not sure I blame this so much on De Lint but rather on the people I've known who believe in fairies and spirits and part of the living in the modern world and having that part be real just reminded me a little too much of them. "Making a Noise in this World"
I'm not a great reader of short stories, but I really like Charles de Lint and especially his Newford books. This collection of 17 stories and 1 novella is simply wonderful. Lots of magic, lots of music, some funny, some quite dark in tone, but they are beautifully written. Old friends like Jilly and Christy pop in and we find out a bit more about them. My favourites in the set are "Ten For The Devil", (fancy meeting Robert Johnson here) and "Pixel Pixies". I just love the idea of a hob in a book I'm not a great reader of short stories, but I really like Charles de Lint and especially his Newford books. This collection of 17 stories and 1 novella is simply wonderful. Lots of magic, lots of music, some funny, some quite dark in tone, but they are beautifully written. Old friends like Jilly and Christy pop in and we find out a bit more about them. My favourites in the set are "Ten For The Devil", (fancy meeting Robert Johnson here) and "Pixel Pixies". I just love the idea of a hob in a bookshop, I could do with one for my study! I absolutely love Charles de Lint. When I found that he had whole collections of his books I was so excited! I love reading these modern day fairy tales. It brings magic into a world where technology rules. Pixie Pixels was by far my favorite because of how it ties magic and technology together. And also Granny Weather for its dream like essences that I feel I can connect to and visit if I want to. If you love magic and fairies, and worlds not too far from our own you should definitely pick up t I absolutely love Charles de Lint. When I found that he had whole collections of his books I was so excited! I love reading these modern day fairy tales. It brings magic into a world where technology rules. Pixie Pixels was by far my favorite because of how it ties magic and technology together. And also Granny Weather for its dream like essences that I feel I can connect to and visit if I want to. Charles de Lint is the much beloved author of more than seventy adult, young adult, and children's books. Renowned as one of the trailblazers of the modern fantasy genre, he is the recipient of the World Fantasy, Aurora, Sunburst, and White Pine awards, among others. Modern Library's Top 100 Books of the 20th Century poll, conducted by Random House and voted on by readers, put eight of de Lint's b Charles de Lint is the much beloved author of more than seventy adult, young adult, and children's books. Renowned as one of the trailblazers of the modern fantasy genre, he is the recipient of the World Fantasy, Aurora, Sunburst, and White Pine awards, among others. Modern Library's Top 100 Books of the 20th Century poll, conducted by Random House and voted on by readers, put eight of de Lint's books among the top 100. De Lint is a poet, folklorist, artist, songwriter and performer. He has written critical essays, music reviews, opinion columns and entries to encyclopedias, and he's been the main book reviewer for The Magazine of Fantasy & Science Fiction since 1987. De Lint served as Writer-in-residence for two public libraries in Ottawa and has taught creative writing workshops for adults and children in Canada and the United States. He's been a judge for several prominent awards, including the Nebula, World Fantasy, Theodore Sturgeon and Bram Stoker. Born in the Netherlands in 1951, de Lint immigrated to Canada with his family as an infant. The family moved often during de Lint's childhood because of his father's job with an international surveying company, but by the time Charles was twelve—having lived in Western Canada, Turkey and Lebanon—they had settled in Lucerne, Quebec, not far from where he now resides in Ottawa, Ontario. In 1980, de Lint married the love of his life, MaryAnn Harris, who works closely with him as his first editor, business manager and creative partner. They share their love and home with a cheery little dog named Johnny Cash. Charles de Lint is best described as a romantic: a believer in compassion, hope and human potential. His skilled portrayal of character and settings has earned him a loyal readership and glowing praise from peers, reviewers and readers. Charles de Lint writes like a magician. He draws out the strange inside our own world, weaving stories that feel more real than we are when we read them. He is, simply put, the best. Charles de Lint is the modern master of urban fantasy. Folktale, myth, fairy tale, dreams, urban legend—all of it adds up to pure magic in de Lint's vivid, original world. No one does it better. To read de Lint is to fall under the spell of a master storyteller, to be reminded of the greatness of life, of the beauty and majesty lurking in shadows and empty doorways. His Newford books, which make up most of de Lint's body of work between 1993 and 2009, confirmed his reputation for bringing a vivid setting and repertory cast of characters to life on the page. Though not a consecutive series, the twenty-five standalone books set in (or connected to) Newford give readers a feeling of visiting a favourite city and seeing old friends. More recently, his young adult Wildlings trilogy—Under My Skin, Over My Head, and Out of This World—came out from Penguin Canada and Triskell Press in 2012, 2013 and 2014. Under My Skin won 2013 Aurora Award. A novel for middle-grade readers, The Cats of Tanglewood Forest, published by Little Brown in 2013, won the Sunburst Award, earned starred reviews in both Publishers Weekly and Quill & Quire, and was chosen by the New York Times Editors as one of the top six children's books for 2013. His most recent adult novel, The Mystery of Grace (2009), is a fascinating ghost story about love, passion and faith. It was a finalist for both the Sunburst and Evergreen awards.